Computers are more affordable these days than they ever have been. But what if affordable ain't affordable enough—what if you need absolute, rock-bottomest, dirt cheap? 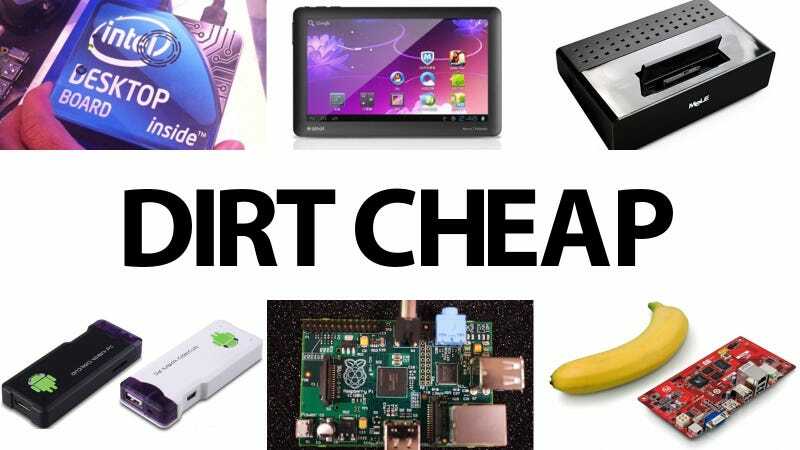 Our friends at Laptop Mag rounded up the 8 cheapest computers in the world, just for you. When the PC era began in the early 1980s, you'd be lucky to find a computer for under $3,000. Today, you can buy a notebook that's hundreds of times more powerful than the original IBM PC for well under $400, but for many people around the world, even that is too much. A new generation of low-cost tablets, USB-sized computers and miniature motherboards can put an entire world of computing power in the palm of your hand for as little as $25. More than just a machine with a cute little name, the Raspberry Pi flaunts high-performance video and graphics on a single-board computer. It can even run popular video game Quake III and play back full HD video using HDMI. Developed in the UK by the Raspberry Pi Foundation, this "system on a chip" was originally built to help teach basic computer science in school. Today, the Foundation offers two flavors of Raspberry Pi, priced at $25 or $35. Late last year, India announced a noble project to the world: The country would create the "world's cheapest tablet computer," intended for students and offered at the lowered price of $35, and later on in stores for $60. Available as of October 2011, the Aakash — eventually called the Datawind Ubislate 7 on retail availability — features a 366 MHz Connexant CPU, 256 MB of RAM and 2GB of storage (expandable via microSD). Instead of a capacitive touch screen, however, the tablet has a 7-inch resistive LCD display, runs on the Android 2.2 operating system and has access to the Getjar market instead of the traditional Android Market. Though it notches a rather short battery life of three hours — and even shorter when you're playing HD video — the endeavor is still an altogether laudable one for a population where most commercial tablets have simply been out of reach. The Aakash education-focused tablet from India later gave rise to a predecessor, the Aakash 2. Both tablets are technically tweaks on the Datawind Ubislate, but the Aakash 2 is a more ramped up version with a 7-inch capacitive touch screen, a 700 MHz ARM Cortex-A8 processor and a 3200 mAh battery — notably, specs that are almost twice as good as the original project blueprint. In terms of software, the Aakash 2 is surprisingly set to get Android 4.0 Ice Cream Sandwich and finally gives users access to the beefier Android Market apps ecosystem. Connection methods include WiFi and GPRS. Picking up this slate will run you either $40 or $60, according to a couple of different sources. Aside from garnering a cult following, the Raspberry Pi also inspired a wave of imitators — and it's easy to see why. These thumb-sized, cheap and Linux-powered devices gave a new population access to technology and innovation, and the (relatively new) Mele A1000 doesn't stray from this philosophy. Already out in the market for $70, the Mele A1000 is an ARM PC that runs Android 2.3 originally, but can be tweaked to run Ubuntu Linux as well. It's powered by the ARM-based Allwinner A10 chip and a 1.2 GHz Cortex A8 ARM core processor. Graphics-wise, a MALI400MP OpenGL ES 2.0 GPU is onboard, and if you ever get the itch to run apps on a TV, the Mele A1000 can handle this task with aplomb. The device also features an SD card slot and USB ports for additional attachments, along with an external SATA port and Ethernet. Computer tweakers, start using your imagination. Sneakily stuffed into a package that resembles a USB flash drive, the $74 MK802 is a mini PC that vaunts a 1.5 GHz Allwinner A10 processor, 512 MB of RAM, 4 GB of storage and runs Android 4.0. Not bad for a little stick that weighs just 7 ounces and measures a diminutive 3.5 x 1.4 x 0.5 inches. If you've been lusting after FXITech's $200 Cotton Candy, but weren't feeling partial to its heftier price tag, this is the alternative to consider. It's worth noting that this competitor doesn't have an HDMI connector, only an HDMI port, and you're only getting a single core processor instead of Cotton Candy's 1.2 GHz Samsung Exynos dual core chip. But for less than half the price, the Chinese-manufactured MK802 — with free shipping to the US from AliExpress.com — is worth a serious look. Pricing details are scant on Intel's NUC or "Next Unit of Computing," slated for release in the second half of 2012, but if the advertised specs are anything to go by, it's worth keeping a close watch on the product. Inside the 10 x 10 cm demo box, you've got a choice of either a Core i3 or Core i5 Sandy Bridge processor, with connection options that include Thunderbolt, HDMI and USB, all wrapped up in a 10 x 10 cm box. In terms of graphics, you'll see the decent integrated Intel HD 3000 onboard. Apparently Intel told press outlet Just Press Start that the NUC will "not be in the hundreds or thousands range," and that different SKUs would likely be available — that's good news for the mainstream public, although it has never been made clear where the product will ship. But either way, with one of the biggest names in the industry behind the endeavor, we're interested to see how this project takes shape. It's usually a safe bet to write off a $120 Android tablet as a flop, but the Ainol Novo 7 is actually worth considering. The slate features a 1024x600 IPS display, 8GB of Flash memory (expandable up to 16GB via microSD) and 802.11 b/g/n WiFi. Even better, it's run by a 1.2-GHz ARM Cortex processor and comes dripping in Android 4.0 Ice Cream Sandwich, so you should be able to watch movies, play popular casual games and surf the Internet with ease — up to its rated battery life of 8 hours, to boot. If you're not averse to having a naked motherboard on your desk and you're attracted to extremely cheap price tags, the VIA Technologies' APC 8750 could be the Raspberry Pi alternative of your dreams. This tiny, barebones PC measures 17 x 8.5 cm and can be plugged directly into a TV or monitor, or stuffed into the undersized chassis of your choice (a standard Mini-ITX or microATX, for instance). The device runs Google Android 2.3 (for mouse and keyboard input), and is powered by an 800MHz clock processor with 512MB of RAM and 2GB of NAND Flash graphics. You also get VGA and HDMI display ports, HDTV support, four USB 2.0 ports and a microSD slot for expandable storage on the undersized device.